"Becoming a future Habitat homeowner is a life changing experience. We are at a loss of words for such an amazing opportunity. With our Habitat home we will have security, stability, comfort and a safe place we can call home." Phase 3, Unit 5 and 6 Groundbreaking ceremony took place on May 3, 2017. 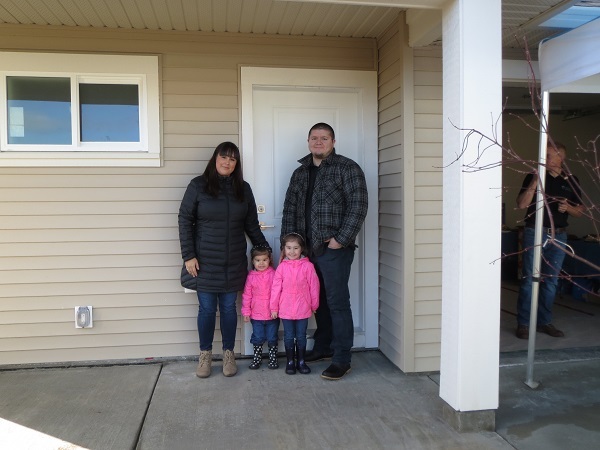 Justin, Bianca and their children Nevaeh and Bristol will be the future homeowners of this Habitat home. Currently, Justin and Bianca are paying high rent for an old house which has humidity issues causing mold, mildew and an infestation of silverfish throughout the house. The house is cold as well, so running heaters and dehumidifiers creates a large hydro bill. The conditions inside the house cause health issues for Bianca and frequent colds for both children. Justin and Bianca want a home for their family that is comfortable and healthy. On November 23, 2017, after many days of rain, the sun shone brightly for the Dedication Ceremony for Unit 5 and 6 of the Meadow Hill development. Justin, Bianca and their children standing at the front door of their future home at the Dedication Ceremony. Justin and Bianca are currently working on their 500 sweat equity hours. The completion date for Unit 6 was December 2017.